Don’t get cute in the fantasy playoffs. Start your studs. You’ve heard that one before, I’m sure. But far too often, people hit me up with horror stories of how they over-though a matchup and benched a fantasy starter for a bench guy in a good matchup. That sort of play rarely works. When it does, you feel like a genius. But when it doesn’t, well, you feel like an idiot. So stick to the script. But also, realize that the making the right plays doesn’t always work out. Take last night for example. Derrick Henry shook up the world with his historic performance. And he did so in just 15% of starting fantasy lineups. Seeing Henry’s massive fantasy output on your bench has to sting, but there’s a high probability that you made the right play in benching him. Henry has done a whole lot of nothing for much of the season, and there was no reason to believe that he’d torch the second-worst fantasy matchup for running backs. All of the factors were against him. But sometimes, wrong plays end up being the best plays. However, far more often, the right plays are better. Make those plays, and you’re going to win more often than you don’t. But hey, if it doesn’t work out for you, don’t take it too hard. If you made the right plays and Henry, or someone else, blows up on your bench, that’s out of your hands. At that point, it’s not your fault. The No. 1 fantasy quarterback over the last two weeks is Josh Allen. Not quite how we drew it up, but Allen has been a monster with his legs. His 234 rushing yards over that span are more than all but eight other signal-callers have on the entire season. While Allen still comes with major fantasy volatility, he’s in play as a desperation Hail Mary option for anyone who is hard up at quarterback this week. Who the heck is Jeff Wilson? He’s a back-end RB1 in fantasy this week, that’s who. The rookie is an unlikely strong fantasy play with Matt Breida sidelined, but he’s poised for a full workload as the 49ers lead back. Last week, Wilson racked up 134 scrimmage yards on 23 touches. Expect similar volume for Wilson this week. Jaylen Samuels has been the hottest name of the week in fantasy circles. With James Conner sidelined, Samuels will serve as the lead back, but fantasy players shouldn’t get too carried away. Stevan Ridley is also in the mix for touches. The Steelers haven’t been entirely clear on how they’ll use both backs, so it’s best to view Samuels as a borderline RB2 and Ridley as a flex play in deep leagues. There’s a lot of mystery surrounding Cam Newton’s status for this week. The star signal-caller is dealing with a shoulder injury and was not throwing in Thursday’s practice session. While this news doesn’t sound good, Panthers OC Norv Turner said he expects Newton to play. Fantasy owners shouldn’t be too concerned, but it’s always wise to have a backup plan in place, just in case. As expected, Melvin Gordon has yet to get back in practice for the Chargers and is on track to miss Sunday’s contest. With Gordon out last week, we saw a ton of Austin Ekeler in the first half, but Justin Jackson stole the show in the second half. This is a tricky situation to navigate, but both players are actually worthy of RB2 status this week. Ekeler figures to continue to dominate passing downs, but Jackson could get more volume in the run game. Veteran wideout DeSean Jackson missed practice on Thursday for the Bucs. He’s dealing with a thumb injury that kept him out last week. If Jackson is sidelined again, look for Chris Godwin to benefit the most. Godwin will be a WR2 play with Adam Humphries slotting in as a high-floor WR3. More injury notes: T.Y Hilton has missed both practices so far this week, which typically doesn’t bode well for a player suiting up. Writers on the Colts beat expect him to play, but Hilton owners should be prepared for the worst-case scenario. … Pierre Garcon looks like he’ll miss another game this week, which means more of Dante Pettis. The rookie wideout broke out last week and is in the flex conversation for Week 14. … Keep an eye on Duke Johnson’s status heading into the weekend. The Browns running back has missed the last two practices due to a personal matter. … Jets RB Isaiah Crowell has yet to practice this week with a toe injury. Crowell is coming off a strong performance last week, but he’s trending toward not playing. … Kerryon Johnson still isn’t practicing for the Lions and will likely miss another game. Look for LeGarrette Blount to again lead the Lions backfield. Keenan Allen is coming off a massive 19-target outing last week against the Steelers. Better yet, he’s scored in each of his last four games and leads all wide receivers in fantasy scoring over that span. And despite the production, his price remains at a reasonable $7,900. Allen is a must-play this week against a Bengals defense that has allowed a league-high 19 touchdowns to opposing wide receivers this season. Allen will see primary coverage from Darqueze Dennard, who is allowing 76% of his targets to be caught. You’re starting DeAndre Hopkins every week, but he’s especially interesting in this matchup against the Colts. Hopkins figures to see plenty of Pierre Desir, just like he did in Week 4. In that contest, Hopkins racked up 3 catches for 73 yards. That’s a hefty yards per catch, which is an area where Desir has struggled this year. Opposing wideouts have racked up 14.0 yards per reception against Desir. Hopkins is appealing in DFS contests this week. Amari Cooper seems to have found his fit with the Cowboys. In the five weeks since joining the team, Cooper is eight among wide receivers in fantasy points, thanks in part to three touchdowns over that span. He’s been especially good over the last two games with eight catches in each of those contests. Better yet, Cooper gets a nice upgrade this week against ta decimated Eagles secondary that doesn’t have a single player currently grading out inside the top 100 corners. With DeSean Jackson sidelined last week, Chris Godwin went out and had himself a day. The second-year man topped 100 yards and found the end zone against the Panthers. Godwin offers upside again this week with a favorable matchup on tap against Eli Apple. 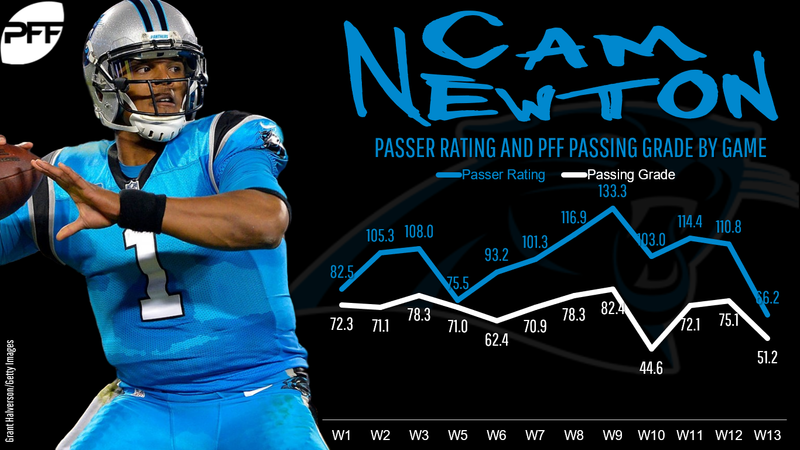 Opposing quarterbacks have targeted Apple 76 times this season. That’s sixth among corners. And Apple has especially struggled over the last two weeks with 15 catches on 20 targets in his coverage. Somebody has to catch the ball for the Cardinals. With Christian Kirk now on injured reserve, Larry Fitzgerald is essentially the only show in town for the Arizona pass catches. Expect Fitzgerald to see a healthy workload this week. Better yet, he draws a favorable matchup out of the slot against Nevin Lawson. The Lions corner has surrendered five touchdowns in his coverage this season. Josh Norman was once a name that struck fear in fantasy players any time their receivers had to face him. While we do expect a shadow from Norman on Odell Beckham this week, it isn’t something to get too worked up over. Norman is allowing 71% of his targets to be caught with five touchdowns in his coverage this season. Kenny Golladay went from the No. 3 in Detroit when the season opened to now being the clear-cut top receiving option. While that role is certainly encouraging, it’s wise to temper expectations for Golladay this week. 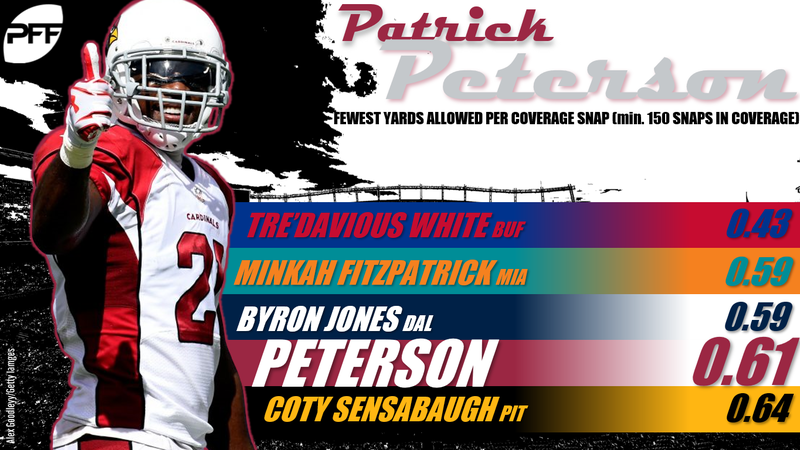 He’s a good bet to draw a shadow from Patrick Peterson when he’s on the outside. While Peterson isn’t drawing the headlines that he has in the past, he’s been excellent this year. He’s only allowed more than two catches in his coverage once over the last six games, and opposing are seeing an average of just 3.8 targets per game in Peterson’s coverage. This isn’t the week to roll with a Bengals wide receiver. John Ross will be shadowed by Casey Hayward in this contest. Ross figures to see a lot of reps with A.J. Green on injured reserve, but he’s likely to be very quiet in this matchup. While Tyler Boyd can be used as a back-end WR2, be cautious with his matchup. Boyd will see his share of Desmond King out of the slot. King is allowing a high catch rate at 80% but has held opposing wideouts to just 8.5 yards per catch. DeVante Parker flashed upside last week with a touchdown against the Bills. While this uptick is encouraging, it’s wise to keep him on the bench this week. Parker will likely draw a shadow from Stephon Gilmore, who has been excellent this season Gilmore has allowed just 47% of his targets to be caught. We don’t know how much will change for the Packers with the interim regime in place, but we do know that Aaron Jones is a plus play this week. The Falcons have struggled against the run for much of the season and opposing backfields have topped 100 rushing yards against Atlanta in each of the last four games. Until just two weeks ago, there was essentially no fantasy buzz around Justin Jackson. But the rookie has changed all of that with impressive performances against the Cardinals and Steelers. Jackson has racked up 15 carries at an impressive 8.0 yards per clip over that span. Better yet, he gets to face a Bengals defense that has allowed a whopping 11 rushing scores to running backs over their last seven games. Keep in mind that Austin Ekeler is still the Chargers’ lead back this week, but Jackson figures to get enough work to be a back-end RB2 play. A lot of folks expect a negative gamescript for Gus Edwards, but it’s tough to see the Ravens air it out with Lamar Jackson under center. While it’s tough to envision a massive week for Edwards, fantasy owners should still be confident in this matchup. The Chiefs are the No. 2 fantasy matchup for running backs with four scores allowed to the position over their last five games. While Spencer Ware didn’t quite deliver on the hype last week, he did manage to find the end zone. But this is a brutal draw for Ware with the Ravens currently sitting as the No. 32 fantasy matchup for running backs. 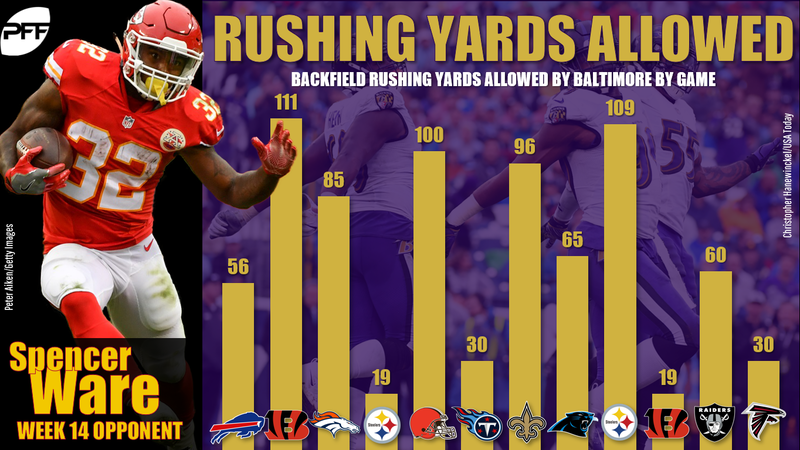 Baltimore has only allowed three backfields to top 100 yards on the season. Ware owners are right to be concerned but should still view him as a back-end RB2 in another potentially high-scoring game for the Chiefs. This isn’t the week to flex Peyton Barber. While the Bucs lead back has shown the ability to post fantasy relevant numbers at times this season, he gets a rough matchup this week against the Saints. New Orleans has shut down opposing running backs for much of the season, and Barber offers little fantasy appeal with his limited upside. It’s hard not to like the Chargers offense this week. The Bengals are reeling on the defensive side of the ball and currently sit as the No. 1 fantasy matchup for quarterbacks. While Case Keenum wasn’t able to do much in this matchup last week, we don’t expect the same for Philip Rivers. Fire Rivers up with confidence as a top-10 fantasy quarterback. It looks like Mitchell Trubisky will be back on the field for the Bears after missing the last two weeks. Before the injury, Trubisky was in the midst of a breakout season, but should you use him this week? While the Rams rank as a mid-pack matchup for quarterbacks on the season, they’re actually the top fantasy matchup for the position over the last five weeks. To be fair, they did face Patrick Mahomes in that stretch, but still, the Rams have allowed 14 passing scores over that span. The popular narrative this week is that the Panthers have struggled against the pass, which is good for Baker Mayfield. But look a little closer. Over the last three weeks, Carolina is allowing an average of 269 yards and 1.7 touchdowns through the air. While those numbers aren’t shutdown, they’re still not enough to justify starting Mayfield over many of your every-week fantasy starters at quarterback. Russell Wilson was fantasy’s top quarterback last year, but things haven’t quite gone as well in 2018. Entering this week, he sits ninth among signal-callers in fantasy scoring, and his owners may actually want to fade him with their fantasy playoff lives on the line. Wilson draws a brutal matchup against a Vikings defense that has allowed just five passing scores over their last seven games, with opposing quarterbacks averaging just 212 passing yards per game over that stretch. This isn’t the week to be an Andrew Luck owner. While Luck has largely exceeded fantasy expectations this season, he’s running into a buzz saw in the first round of the fantasy playoffs. Houston has allowed more than one touchdown pass just once since Week 5. It’s wise to fade Luck this week if you can get away with it.